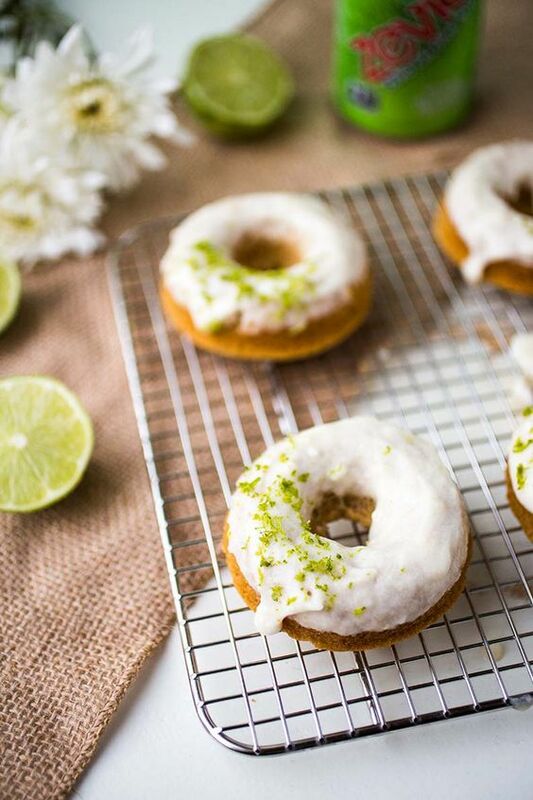 Okay, so I try not to post too many decadent sweet recipes on my blog, but these Paleo Donuts with Key Lime Frosting actually seem like the perfect thing to post following the election. I for one am happy to have these on hand to eat my feelings today. Whether today is a happy or sad day for you, donuts are always the answer, amiright? 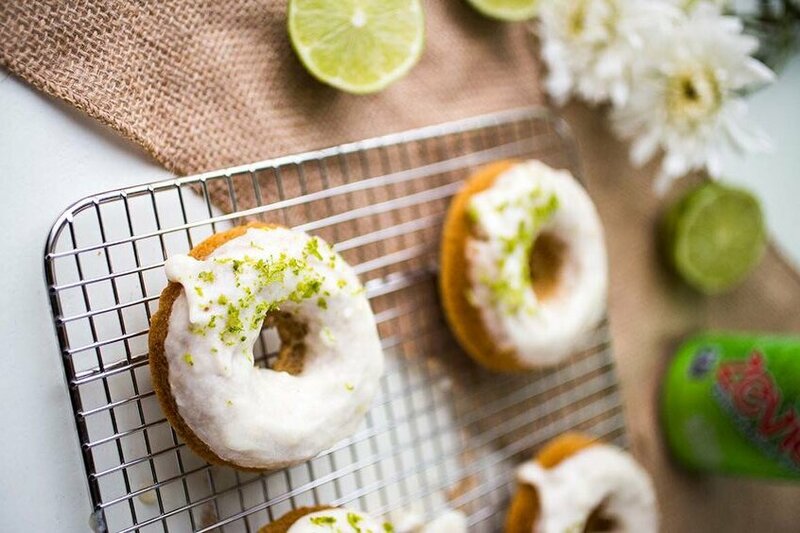 These delicious grain, gluten and dairy free donuts were inspired thanks to Zevia, my favorite all-natural sugar free soda. As we all well know, artificial sugars are perhaps even more damaging than sugar itself, making diet sodas potentially more dangerous than their high sugar partners. For as many years as I can remember, Zevia has always been my go-to choose when I want something delicious and fizzy. For this recipe, the Zevia team challenged me to create a baked recipe using one of their more “complicated” sodas. Ie, cream soda, black cherry or tonic might be a slightly easier choice for baking… Mountain Zevia? Not so much. Let’s just say I was absolutely up for the challenge and more than thrilled at how the recipe turned out! 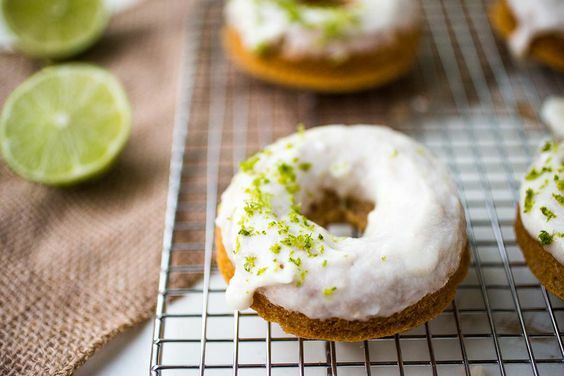 These donuts are fluffy, sweet and citrusy all at once. Not only that, but they only a few tablespoons of added sugar in the form of maple syrup. Although all sweets should be enjoyed in moderation, these sure make a healthier choice! Oh and one more disclaimer. Technically, I didn’t make these with key limes. I wanted to, but wasn’t able to find them at the store. Juice from regular limes will work for this, but key limes are preferred because they have a bit more of a distinct, bold flavor. If you can find key limes in a store near you, simply juice enough of them to get you to the amounts I’ve included in the recipe. If you can’t find them, no worries, these will be delicious regardless! Zest 10-15 key limes as a garnish. This step is optional. Combine all wet donut ingredients aside from ghee in a medium size bowl and whisk until well combined. In a separate bowl, combine all dry donuts ingredients and whisk until all clumps have been removed. Combine wet and dry ingredients and mix until well combined. Generally grease a donut pan with ghee and using a piping bag or zip lock with a hole cut into the bottom corner, gently pipe the batter into the donut pan. The molds should be just about ¾ of the way full. Place in the oven and bake for 10-12 minutes or until a toothpick can be inserted and comes out clean. While the donuts are baking, combine all frosting ingredients in a small bowl and whisk to combine. If the frosting seems too thick, add a bit of water, one teaspoon at a time. Once the donuts have been removed from the oven and cooled, gently dip them into the frosting. Eat right away while the frosting is soft or store in the fridge and let come to room temperature before serving. perfect blend and looks tasty!